Visit Paris’s historic City Hall and take in the Paris Haute Couture exhibit in the Salle Saint-Jean which ends July 6. It’s free. About a hundred masterpieces from the Galliera Museum will be showcased: Doucet, Lanvin, Patou, Chanel, Rochas, Jacques Heim, Dior, Gaultier, Lacroix, Alaia, Balenciaga, Gres, Courreges, Schiaparelli, Balmain, Molyneux, Carven to name a few. 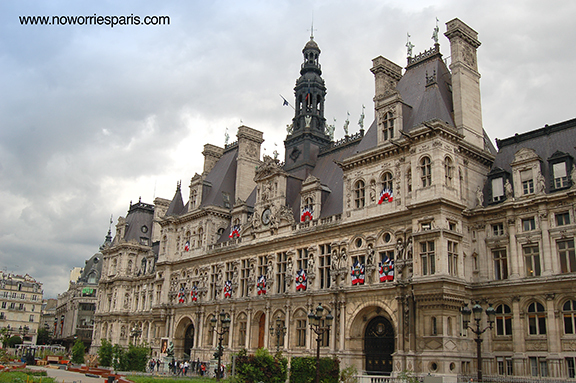 Ever since 1357, the City of Paris’s administration has been located at the same location where the Hôtel de Ville stands today. 1533: King Francis I decided to endow the city with a city hall which would be worthy of Paris, then the largest city of Europe. Building work was not finished until 1628 during the reign of Louis XIII. 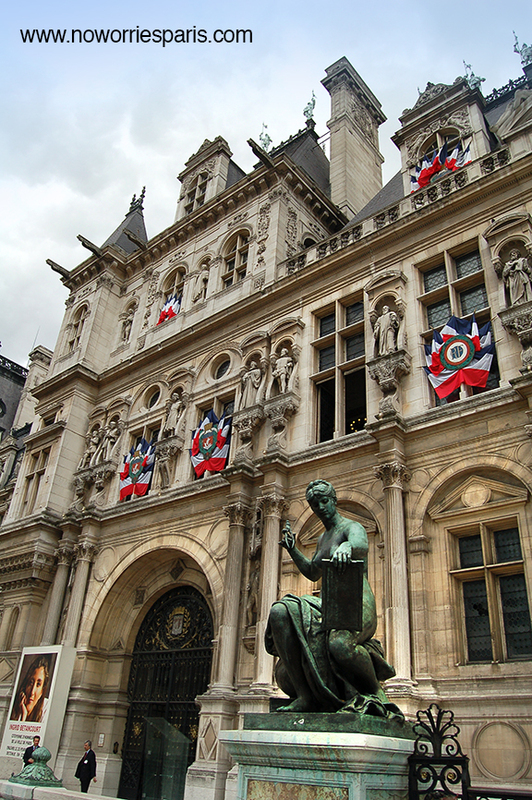 1835: on the initiative of Rambuteau, préfet of the Seine département, two wings were added to the main building and were linked to the facade by a gallery, to provide more space for the expanded city government. 1871: The Paris Commune chose the Hôtel de Ville as its headquarters, and as anti-Commune troops approached the building, Communards set fire to the Hotel destroying almost all extant public records from the French Revolutionary period. The blaze swallowed the building from the inside, leaving only an empty stone shell.